Let's be truthful. We all prepare the vegetables and eat the turkey. We complement the host/hostess on the table setting. There is birthday cake, Christmas cookies and Valentines Day candy. Pie is what is for dessert on Thanksgiving. I don't believe I have ever celebrated Thanksgiving and served only one pie. The joy is in choosing -- apple, cherry, pumpkin, or pecan? Maybe both or a little of each? I like to serve the dinner and then give it time to digest. There are usually pots and pans to clean up and a dishwasher to fill. Meanwhile I bake off and warm up dessert. My all time favorite Thanksgiving pie is squash pie made with OnePie filling. My second favorite is pecan pie. My husband's favorite is chocolate cream. A few years ago I got daring and made a chocolate pecan pie. Honestly I thought we would be packing it up and sending home with my guests but it turned out to be quite popular with all of the kids. 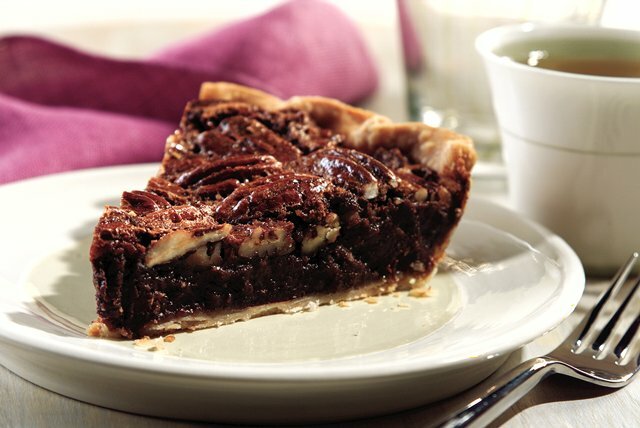 It isn't nearly as sweet as a pecan pie (which is often why it is not chosen) and it fits the bill for my chocoholic family members. Be daring this year and try it. My stained and wrinkled copy of this recipe is only testimony that I saved the recipe many years ago and only got the courage to try it recently. Heat the oven to 350 degrees. Coarsely chop 4 squares of the chocolate and set aside. Line a 9-inch pie plate as directed on package with pie crust. Microwave remaining 4 squares of chocolate and butter in large microwaveable bowl on high for 1 to 2 minutes or until butter is melted. Stir until chocolate is completely melted. Brush bottom of pie crust with a small amount of beaten egg. Stir sugar, corn syrup, eggs and vanilla into chocolate mixture until well blended. Stir in pecans and chopped chocolate. Pour into pie crust. Bake 55 minutes or until knife inserted 2 inches from the edge comes out clean. Cool on wire rack. Makes 8 servings (or more if everyone has a little of both). I agree with the comment on pecan pie being too sweet. I found a recipe some years back that added 1 cup of fresh cranberries to the pecan pie. That sour little berry cut the sweetness down. I then took it one more step and tried adding 1 cup of chopped rhubarb (I grow rhubarb, not cranberries) to the pecan pie and that also adds the sour and cuts the sweetness.